Tattoos and Piercings: Are there unintended effects? I spent last weekend at the Portland Tattoo Expo, giving bodywork treatments to tired tattoo artists and attendees. What a fun experience, to be surrounded by illustrated people! Body modification is nothing new. I’m sure the first caveman had a good time jazzing up his chassis, starting with paint and continuing on to more permanent decisions. The location, color, and motifs of these designs have been important in many ways. They have indicated status and held religious meaning. They have shown membership in a larger group, or had medicinal or protective properties. Of course in some cultures they are just creative, artistic expressions of the human spirit. “Otzi the Ice Man” lived 5,300 years ago. His frozen body, discovered in 1991, has revealed much about prehistoric life. I could write pages about the secrets he shared, but for now let’s focus on his tattoos. X-rays indicate he had lower back and knee pain. 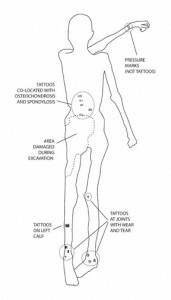 The dotted and lined tattoos he bore relate to acupuncture points to treat those areas. They were hidden under clothing, so they were clearly not just decorative. Update 1/8/13: Otzi now “lives” in a museum exhibit in northern Italy. My first thought was a question. I wondered if the application of the tattoos was itself the treatment, or if it was a guide to show him where to apply acupressure. I’ve certainly been known to send patients home with Sharpie marks to indicate where they should press for the next few days. The process of tattooing will of course stimulate the point, and act as an effective treatment. Long term, however, the ink doesn’t continue to activate the area (as far as I know). Piercings have a more lasting energetic impact because of the jewelry. Metal blocks energy flow. I think this is actually how acupuncture works – the surgical steel of the needle disrupts the energy flow and draws the body’s attention to the area. A tiny needle, in place for a few minutes, has a therapeutic effect. A large gauge piercing, worn permanently, can cause problems by overstimulating the area. This is one of the reasons why I’m not a fan of the Daith piercing. 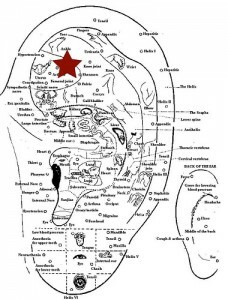 I’ve had patients develop unexplained shoulder pain, digestive trouble, and migraines following body modification to those corresponding points on the ear. I encourage them to either remove the piercings or at least switch to glass or bone. Personally, I wear earrings out for events, but not day-to-day and I never sleep in them. I used to have a belly ring but had to remove it due to interference with my Ren channel. Not everyone is sensitive, though: Plenty of people have piercings with no ill effects. It’s up to you as an individual to weigh the impact vs. advantage. There was a recent discussion on an acupuncturist’s discussion board where a number of providers cited patients unconsciously placing tattoos where they need treatment. For example, someone with a Spleen* deficiency having a design above her inner ankle. I haven’t seen that trend myself, but I do recall a particularly disturbed young man I met while waiting in line for a fitting room at Goodwill. He was clearly mentally ill, and very agitated. He had Shenmen (the seat of mental health) pierced on both sides, an unusual location for an earring. I asked him why he chose that site, and he said it just felt right. Shen Men is a terrific point, and I think his instinct to stimulate the point was a good one, but he went about it the wrong way. Having a large piece of metal blocking the point 24/7 can actually cause more problems. 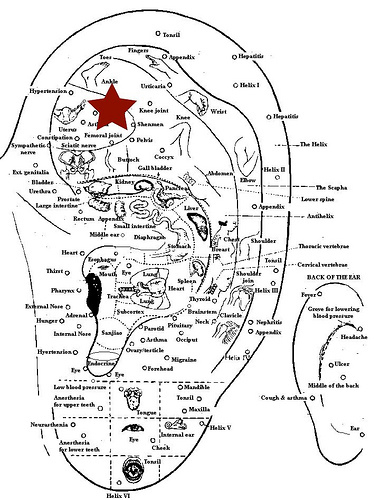 Ear acupuncture points (most of them) with Shenmen marked. I’m not anti-body-modification. In fact, I have an ankle bracelet tattoo myself that says “VIVO VT SERVIAM” – Latin for “I live to serve.” As with all big changes to your body, however, you should undertake them with thought. *Remember that in Chinese medicine, capitalized organs are energetic concepts and should not be confused with your anatomical organs. In this case, the Spleen transforms food into energy, while your physical spleen stores and filters blood, and plays a role in the immune system. This entry was posted in Healthy lifestyle, Most popular articles, Traditional Chinese Medicine (TCM) and tagged acupuncture, piercing, piercings, tattoo, tattoos by Sharon Rose. Bookmark the permalink. Woah this weblog is magnificent. I love reading your articles. Keep up the good work! Lots of people are hunting for this information. Have you ever considered publishing an ebook? You’re amazing! From all of the articles I’ve searched on the internet, yours is the most explicit and neutral… Congratulations for a beautiful and intelligent soul!